“Do we need to call this ‘Constructive Journalism’? It’s just good journalism,” one student at the back said. All over the room, heads nodded in approval. 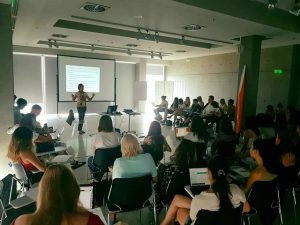 Most of the 46 students at the International Journalism Media Summer Academy in Thessaloniki had never heard of the term “Constructive Journalism” before, yet it just made sense to them that when journalists expose a problem, they should try to explore solutions as well. And that reporting on progress and possibility has its place, alongside covering crisis, crimes and tragedy. I had been invited to the beautiful city of Thessaloniki in Greece, in July, along with colleagues from Croatia, Germany, Russia and Ireland, to present lectures and workshops on ‘New Trends in Media and Journalism: Disinformation, Verification of News and Constructive Journalism in a Changing World’. It was wonderful to see students from Greece, Russia, Croatia Ukraine, Germany, Brazil, Bosnia, The Netherlands, Slovenia, and the US, China and other countries, debate and build connections – and listen to their various perspectives. When we discussed the coverage of the refugee crisis in their respective countries, most students said that the media mostly stressed the problems posed by migration and the burden it imposes on social services, but others had another take. Greek students, for example, said that while the coverage was alarmist and negative at first, over the years, there were also stories of solidarity and on the contribution made by migrants. This was unexpected as Greece is one of the countries most affected by the influx of migrants and in the midst of a serious economic crisis. We found examples of constructive stories from a rapidly growing media pool – from the New York Times and the Guardian Upside to the BBC World Hacks, Positive News and De Correspondent. We explored how to interview the so-called “victims” in a way that doesn’t reduce them to their situation, but shows their resilience and preserves their dignity. And we looked at how we can ask different questions to those in power, the experts and those who hold different views. The idea that journalists can facilitate engagement between people from different religious and ethnic groups, political views or age, rather than fuelling polarisation and conflict, led to heated discussions. We concluded that it’s not the journalists’ role to advocate a solution or campaign for integration, but to show how communities are coming together across these lines to engage with one another, and how problems that they are facing are being tackled elsewhere. At the end of the day, the students decided to call this type of journalism “Responsible Journalism.” I kind of like that!